Günter Baby Sommer is a German jazz drummer. Sommer is regarded as an architect of contemporary European jazz. He has added his own vocabulary to the language of jazz drumming, moving beyond the complex rhythms of hardbop forebears like Art Blakey to melodic playing on tuned, specially constructed drums and other objects in his arsenal of both musical and non-musical provenance. He has performed with the leading avant-garde musicians of his day and with dancers, actors, and writers such as Günter Grass and Christa Wolf. He is an accomplished composer who has written pieces for theater and dance, as well as for the various musical aggregations of which he has been a part. In many ways Sommer personifies the up and down history of jazz in his homeland, the former German Democratic Republic (GDR) or East Germany. Sommer was born on August 25, 1943, in Dresden, Germany. He took accordion lessons as a child but did not particularly like the instrument. When he was 12 or so, he heard Louis Armstrong for the first time and switched over to trumpet. It was then he had a fateful encounter with an older boy who had heard him play. The friend said only "Come over to my house some time, and I'll play you something good." The friend had an old tape recorder and tapes he had made of Willis Conover's Voice of America (VOA) jazz broadcasts. "That I found very interesting," Sommer told Contemporary Musicians. By the time Sommer first heard the VOA jazz broadcasts in the middle 1950s, his part of Germany had become the German Democratic Republic, a staunch socialist ally of the USSR. American culture, including jazz music, was denounced by the GDR as an imperialist threat to socialism. Jazz seemingly ceased to exist there officially; there were no more jazz records, no more jazz concerts, and no more jazz radio broadcasts from inside East Germany. The music went underground, and Sommer became a 13-year-old jazz partisan. Every evening at midnight, he crept past his parents' bedroom door and hurried to his friend's house. Sommer and his friend crouched in front of an old shortwave radio and listened to jazz greats including Dizzy Gillespie and Horace Silver. "We sat there like older people had during the war when they listened to the BBC from London or something like that," Sommer told Contemporary Musicians. "It was exciting!... That [music] affected me deeply.... I knew that was my music." Sommer then started playing trumpet in a small dance band. Not long after, the band's drummer quit. Each of the other band members auditioned for the spot. "I was the most talented and gifted," Sommer said. He too left the band not much later. Sommer wanted to play music like Gillespie, Miles Davis, and Charlie Parker; the band was playing dance music. When Sommer was 17, he hooked up with the Boheme Sextet, a local Dresden jazz group interested in the hardbop that was coming out of the United States. They were a kind of cover band, playing early Blakey and the music of the Jazz Messengers. As Sommer tells it: "We had a trumpeter who copied Lee Morgen, a saxophonist who copied Bennie Golson, a bassist who copied Jimmy Merritt, and a pianist who copied Bobby Timmons. I copied Art Blakey!" Blakey's drum style provided the model upon which Sommer would base his own playing for the next five or six years. In the early Sixties, opportunities to hear or play jazz were few in Dresden. The real jazz scene in the GDR, which was also underground, was in the capital of Berlin. But once a week there was a series of clandestine jam sessions in Dresden in a hotel on the outskirts of the city. A Berlin band, headed by trumpeter Klaus Lenz, played there frequently. At first, Sommer just listened; he was too unsure of himself get up and to play. Finally a friend convinced him to climb onstage. His playing impressed the others and before he knew it, Sommer was part of the Berlin jazz world. Throughout the early 1960s, Sommer lived in Dresden and studied at the Dresden Hochschule für Musik (College of Music) in its Department of Dance and Popular Music. Sommer spent weekends in Berlin playing with the Klaus Lenz Band. 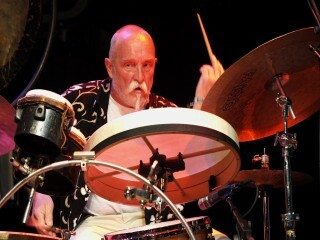 Different influences, which would ultimately change Sommer's drum style, began to converge in the middle and late 1960s. In 1966, he joined the Friedhelm Schönfeld Trio, one of the first East German jazz combos to experiment in free jazz; the group tried to cut itself loose from the harmonic and rhythmic restrictions of earlier jazz. Losing the rhythm was difficult at first for Sommer, coming as he did from the rhythmically dynamic Blakey school of drumming. "They told me at first I had to play much freer, forget four-four and all those things, but I didn't have the ear or the experience." Sommer told Rolf Reichelt in Europas Jazz. "So I just tried to understand and do what was expected of me, and I did away with the beat. On the other hand, we played pieces, and in between I was supposed to play 'free.' All that confused me a lot. So completely free, no tunes, no melodies, no rhythm--it was crazy." A few years later Sommer read Free Jazz/Black Power by Philippe Carles and Jean-Louis Comolli. The book portrayed jazz as an essential product of black American culture and accused white musicians, who played in the style of black players like John Coltrane, Thelonious Monk, and Art Blakey, of being thieves and of appropriating a cultural tradition that did not belong to them. Sommer took the book to heart. Around 1970, he consciously stopped imitating the black American masters and began to search for a style that reflected his own European heritage. He found the answer the first time he heard Dutch drummer Han Bennink. "That was a strange chapter. Coming out of this past with Blakey and then all of a sudden this Bennink comes along, whom I had never seen live. The ground fell away from under my feet, everything that I had been working out for myself, gone like that. He just handed me the ready-made answer I was looking for," Sommer told Reichelt. "It was hard for me. It was a bad time. I ran straight into Bennink's arms, but then I had to try to get past him, either on the right or the left." Another important chapter in Sommer's life, one just as important as the encounter with Bennink, was Synopsis. The group consisted of four of the GDR's heavyweight jazz players: saxophonist Ernst-Ludwig Petrowsky, trombonist Konrad Bauer, pianist Ulrich Gumpert, and Sommer. The group was, as Ekkehard Jost wrote in Europas Jazz, "of central importance for the development of free jazz in the GDR in the 1970s." The group's remarkable performance at the Warsaw Jazz Jamboree in October of 1973 was one of the first indications the outside world got that something was happening in East German jazz. Synopsis could do it all: they played free, they played set pieces, they quoted snippets from German folk melodies, and they cited older jazz styles. At the end of the 1970s, when the GDR's ideological take on jazz had done a 180 degree flip-flop--it was now the music of the suppressed black proletariat rather than of the imperialist war mongers--the members of Synopsis were the very first to be allowed to perform beyond the borders of East Germany. They were still performing and recording in 2000 as the Zentralquartett. Sommer played in a variety of duo and trio lineups with his Synopsis partners. With the warming attitude toward jazz in East Germany, he was able to play with a number of European and American jazz artists such as Peter Brötzmann, Peter Kowald, Cecil Taylor, Fred Van Hove, Wadada Leo Smith, Alexander von Schlippenbach, and Irene Schweitzer. Around 1977, Sommer began developing his solo performance concept which he termed Hörmusik, loosely translatable as "music to listen to." The name concealed a radical approach to live music that, in a couple of years, might have been called performance art. The idea went back to Sommer's collection of instruments which had expanded to include gongs, exotic cymbals, kettledrums, tin pipes, and old organ pipes which Sommer played using an old air mattress pump. They had created a problem. "I realized that the visual element was so powerful that people no longer really listened to the drama of the music itself," he explained. "I had large gongs that took six to seven seconds to sound after they were struck. So I would hit the gong and start preparing to do something else. The people would go 'Oh, what's he got there now?!' And none of them listened to the gong!" Sommer told Contemporary Musicians. Sommer's response was to place a curtain in front of his kit on stage so that the audience could not see him when he was playing. On the front of the taut white scrim he projected a photo of his drum kit. Reactions varied. Some people complained vehemently that it was unfair to them to block their line of sight. Others told Sommer that without the screen, they would never have realized that "real" music could be played on the drums. Sommer has had a long, productive working relationship with German novelist Günter Grass. They began appearing together in 1985. These appearances had Grass reading selections from his prose work and Sommer providing accompaniment on drums and various percussion. Until 1989, with the fall of the Berlin Wall, the duo could only appear together in the West. However, the hardline ideology did not permit East and West Germans to appear together in the GDR. Sommer's work with Grass brought him into a crisis situation in 1988. He planned to take part in a tour with Grass in West Germany, but the GDR government, however, refused to issue an exit visa. It had recently imprisoned and expelled a number of East German dissidents, cases that were controversial and well-publicized in the West German media. Sommer, however, was determined to make the tour. He arranged a solo concert, or what looked like a solo concert, for himself in West Berlin. That got him an exit visa. With that in his pocket, he joined Grass in West Germany. When they appeared on TV together, a storm broke. The East German government ordered him to return and announced that his passport was being revoked, thus once he returned, he would not be able to leave again. With Grass' help, the West German SPD, the second strongest political party in the country, came to Sommer's defense. The publicity proved embarrassing for East German head-of-state Erich Honneker who was at that moment making a rare visit to West Germany. A team from the East German Ministry of Culture traveled from Berlin to meet Sommer in Münich. He was able to work out terms under which he could return to the GDR and retain his travel privileges. "It was a high-stakes poker game," Sommer told Contemporary Musicians, "but I won." A little more than two years later, the German Democratic Republic no longer existed, but Sommer continued making music, performing regularly, if less frequently. He teaches courses in percussion and free improvisation at the Dresden College of Music, heads the Jazz and Rock Department with about 40 teachers and 100 students, and he is prorektorof the school, a high administrative position. All these responsibilities consume a great deal of his time during the school year, and as a result, Sommer has to select his opportunities to perform carefully. At the age of 58, Sommer has more energy, elan and excitement than most musicians half his age. Despite his hectic schedule at school, he manages to make music in Dresden and elsewhere in the world. He participates in several ongoing projects, of which the Zentralquartett with Petrowsky, Bauer, and Gumpert is the most long-standing and popular. He performs regularly in Dresden with various string quartets; he finds the mix of classical music and improvisation particularly interesting. The group, Baby Sommer and Swiss Horns, is an unusual combination of Sommer's drums and an ensemble of two-and-a-half-yard long traditional horns from the Alps. It is, Sommer said, "a group that I love a lot." He also plays regularly with a church organist, composes for theater, and works with dancers, dance troupes, writers, actors. Altogether they make up what he calls his partners of movement, of words, and of music. View the full website biography of Gunter Sommer.